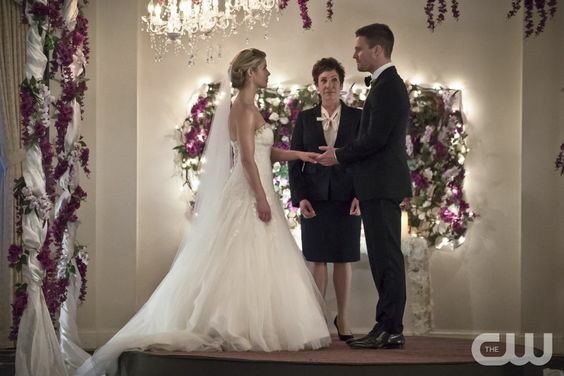 The last episode of Arrow saw the end of Oliver and Felicity's engagement. Now, Team Arrow has to deal with another dose of heartbreak. Cupid is back in town, and she's out for revenge... on love. Cupid is back--and she's terrorizing couples again by her singing, er, I mean, by tying them up and torturing them. After questioning the currently abducted couple, she shoots them both in the heart with arrows. "Love is a bullet to the brain... or an arrow to the heart." Meanwhile, Damien Darhk is on trial. His lawyer hopes to get his case dismissed, so he claims Darhk is someone else from somewhere else and that there is no proof he is--or goes by the name of--Damien Darhk. Flustered, Laurel claims she has proof Darhk is... well, Darhk. In other news, Felicity and Oliver are officially broken up, and Felicity is moving out. Oliver comes into the apartment to find her loading up boxes and going over her genius plan to transport everything out. Then, they briefly discuss what needs to be done to cancel the wedding plans. Oliver sadly reassures Felicity that she is still a part of Team Arrow--forever and always. Team Arrow regroups in HQ despite the night being unusually quiet. They help Laurel with her case, and Felicity spills the beans on her and Oliver's break-up. Diggle talks it over with Oliver. (Good job, Diggle.) Just then, Lance calls about an "old friend." When Oliver arrives--as the Green Arrow--on scene, he learns that Cupid is back in town. She lovingly left her latest victims in a heart shape with a note that reads: "Love is dead." Felicity locates Cupid, who has kidnapped another celebrity couple. (Oh, I see how this episode will play out. Cupid targets celebrity couples like... oh, I don't know... Oliver and Felicity? During her interrogation, they realize they love each other once more and decide to get back together and save the day? Never seen that before, Smallville.) They track Cupid, who has the newlyweds handcuffed in a getaway car. Thea hops on the back of the car, but Cupid drives into a warehouse and knocks her off. Diggle comes to Thea's aid while Oliver chases down Cupid. They fight. Cupid escapes, leaving behind a piece of her jacket sleeve. They rescue the newlyweds. Thea: "Really brings a whole new meaning to crazy ex-girlfriend." Lance gives his testimony. He spills on everything he's done for Darhk, and he tells them why he did it: because Darhk threatened Laurel. (Go, Lance!) While the judge moves Darhk's case to a full trial, Lance is suspended and has to give up his gun and badge. Laurel promises it will only be temporary. Then, Cupid shows up, right on cue. (She's sooo predictable.) Cupid gives a sassy speech about loving making Oliver soft. She shoots him in the chest with an arrow and pulls out a bomb detonator. She continues her spiel about love being a bullet to the brain. But Oliver stands up; he was wearing a vest. He tries to talk Cupid out of it, but she won't. Until Felicity stands up and says Cupid is wrong about love. Love is not death; love is real. And if she dies, it would be worth it because she experienced love. Diggle and Thea (finally) show up and help fight Cupid. They stop her, and the police take her away. Oliver asks Felicity if they can talk about what she said back there, but Felicity doesn't give an answer. She just wants to change out of the dress. Later, Oliver is in HQ watching news reports about Darhk's trial and the ruined wedding. Felicity comes in to grab something. Oliver tells her that what he said at the altar was all true. Felicity says she loves him, but she can't marry him. (I don't... I don't understand.) He tells her she can--that he could be different, that there would be no more lies. But she tells him no matter what he'll always default to the man he was on the island--alone. Then, she gives him back the ring. She says she can't stay here and do this--any of this--any more. She's leaving, and they need to let each other go. Oliver: "I don't want to let you go." Felicity: "I don't want to let you go, but I'm already gone." Darhk is escorted to a cell and is locked up. The lights oddly flicker. He opens his mouth where he has a ring between his teeth. He takes it out and slips it on to his finger. Then, he just smiles. On the Island, Reiter leads Oliver and Taiana to a chamber where an idol sits on a pedestal. Reiter gives a speech about his past and his village being annihilated. He won't allow that to ever happen again. Then, he shoots one of the men in order to show them what the idol does. As the man dies, a weird ghostly light floats out of him and attaches to the idol. Reiter holds up his arm to the idol and weird symbols show up on his skin. (I'm actually really confused!) Reiter orders his men to start killing prisoners, but Oliver and Taiana knock out the men. They steal the idol and run. Taiana tries to destroy the idol, but it doesn't work. Reiter contacts them using a walkie-talkie, threatening they will never find their way out of the tunnels. Oliver and Taiana use the idol to set a trap for Reiter's men. When they find the idol, they attack and take their guns. Cupid's revenge on love was so-so. It could have been better. The events on the Island have started to bore me. I feel like they're just dragging it out. The high points of the episode were Laurel and Lance finally locking up Darhk and Thea's dialogue. Diggle is still cool, but he's been continually thrust into the background. What did you think of "Broken Hearts"?